Overall opinion of this set: not great but would buy more. Why would I buy more? Honestly the only reason is because for $2.99 you get 8 cards, or for the $4.99 rack pack you get 14 cards. I like getting a regular old pack of cards and getting more than 3 or 4 cards. Do I like the design? Not particularly but I like thumbing through a stack of cards. I know everyone has ripped this set to shreds but really other than Topps Series 1 & 2, there isn't much out right now that gives you 8 cards per pack. In total I opened 4 retail packs and 2 rack packs, all for research purposes to show the readers what is inside (at least that is what I'm telling myself now). There is nothing great looking about these cards, nor are they all that exciting but cards are cards. I just like opening stuff. Just some regular cards to make this blog colorful. 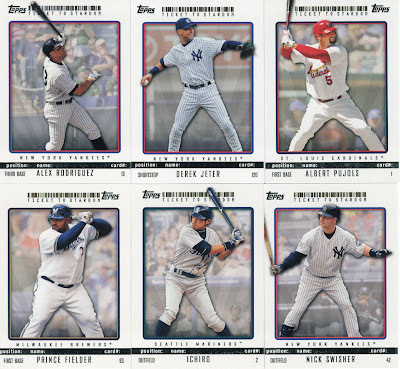 Anyone have any Pujols inserts from this set, please let me know. Damn right, let's go Dodgers. Watching this game from work is agonizing. i like the base design but i'm waiting for the price of hobby boxes to bomb so I can pick up a couple of boxes cheap. They are coming down a little bit and I have to continue to be patient. I like the Ticket Stub cards, but the base is ok. Would you be willing to trade for the Joey Votto card you pulled? Overall, not a bad card set, and I agree with you, the number of cards per pack is nice. In general, though, this set pretty much does scream "meh" to me. The design's decent if not inspiring, and the tickety baby-deckle edged inserts are OK, but have been done before, and unremarkably so. The hook of inserted tickets and stubs is mildly intriguing, but if they have to trim or otherwise destroy the value of the ticket to put it in the card, it's definitely not worth doing it. By my thinking, this set only works if the ticket stubs are from meaningful (if not timeless) games--no-hitters, perfect games, hit-for-cycles, postseason wins, 4-homer games, player milestone games, and so on. Even for Pujols, a trimmed ticket stub of the Cards taking on the Padres in mid-June of 2007 at Petco doesn't really add up to much awesomeness. The concept can work, but doesn't quite work here, I think. 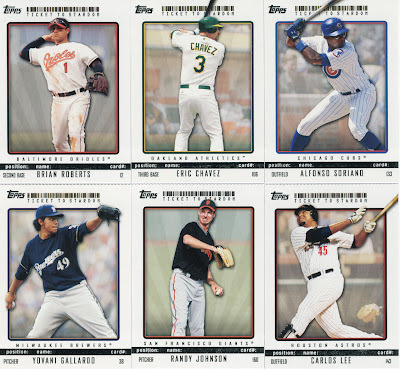 In fact, where it could really work is in Heritage / Americana type sets. How about a Beatles last concert at Candlestick ticket? Or any Beatles concert? Or Woodstock? Or Hendrix at '67 Monterey Pop Festival? Stubs from meaningful concerts of the past could really jazz up a design. Even if the card is over-sized to accommodate the ticket (no trimming!) and a redemption is included for them in packs, that could be a real win-win. The trade, if anyone cares, it is worked out. Don't think I can trust eBay to give me $30+ like that other Pujols ticket went for since I've never actually tried selling anything on eBay before, and I've heard it's not a great idea to start with a big ticket *<--incredibly lame pun alert* item.